HOW CAN TAE KWON-DO HELP YOU ACHIEVE YOUR GOALS? Where is your victory? It’s easy to find when you win. It’s harder to find when you lose. You probably don’t even look for your victory after a loss. Before embracing Martial Arts, I didn’t always. It’s easy to become too focused on what we didn’t gain. Losing is something we’re taught to avoid but losing isn’t the worst thing that can happen to you. Pil-Sung means “certain victory.” Certain victory means harvesting a win out of everything, especially when life doesn’t favor you. It means using every circumstance as a teacher, a path to becoming who you are yet to be. Register for our trial program and see how Tae Kwon-Do can help you become whatever it is you’re yet to be. Participating in our Martial Arts classes will help you find the things in yourself that you think are missing. We’ve got classes for teens, adults, kids, and tigers. If it’s not going to improve your situation then why would you do it? Tae Kwon-Do is fun but it’s challenging at times. Find out how you can benefit from tae kwon-do. 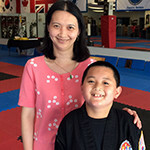 Take a look at our Dojang (school) and see why we’re rated #1 in WNY, plus photos of our tournaments, parties, and more. Other than graduating with 2 master’s degrees, this has been the biggest accomplishment of my life. 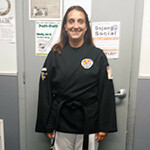 About 3 years ago I started Tae Kwon Do and I weighed almost 340 pounds when I started training with Master Gorino. Not only have I been able to lose about 180 pounds with training but I have become more disciplined as well. Other than graduating with 2 master’s degrees, this has been the biggest accomplishment of my life. Master Gorino's Tae Kwon-Do is Western New York's premier Tae Kwon-Do ​and martial arts school, located in Amherst, NY and proudly serving Buffalo, NY and the surrounding areas, including: Cheektowaga, East Amherst, Getzville, Kenmore, Niagara Falls, North Tonawanda, Tonawanda​,​ and Williamsville. 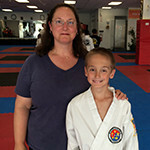 Established in 1994 and led by Master Chuck Gorino, the Tae Kwon-Do school offers martial arts classes for people of all ages, ranging from toddlers to teens and adults. Master Gorino teaches all ​students​ himself, helping ​them become who they want to be while working to achieve their fitness, self-defense and self-improvement goals. We invite you to learn more about ​Master Gorino's Tae Kwon-Do by taking a virtual tour of our facility or registering for our trial program. We believe you'll discover the lasting benefits that Tae Kwon-Do can offer you and your family and we look forward to serving you soon.